Arts matter. They benefit individuals and communities. Everything is connected. Great art engages and inspires everyone from children with crayons to professionals with multi-media installations; local square dancers to international ballerinas; quilting grandmothers to cutting-edge fashion designers. The Arts improve quality of life. enabling intercultural understanding and friendship. The Arts enable innovation and education. 65% of Saskatchewan people have been personally involved in artistic activity in the past year. It’s the highest rate in Canada (overall Canadian rate = 53%). 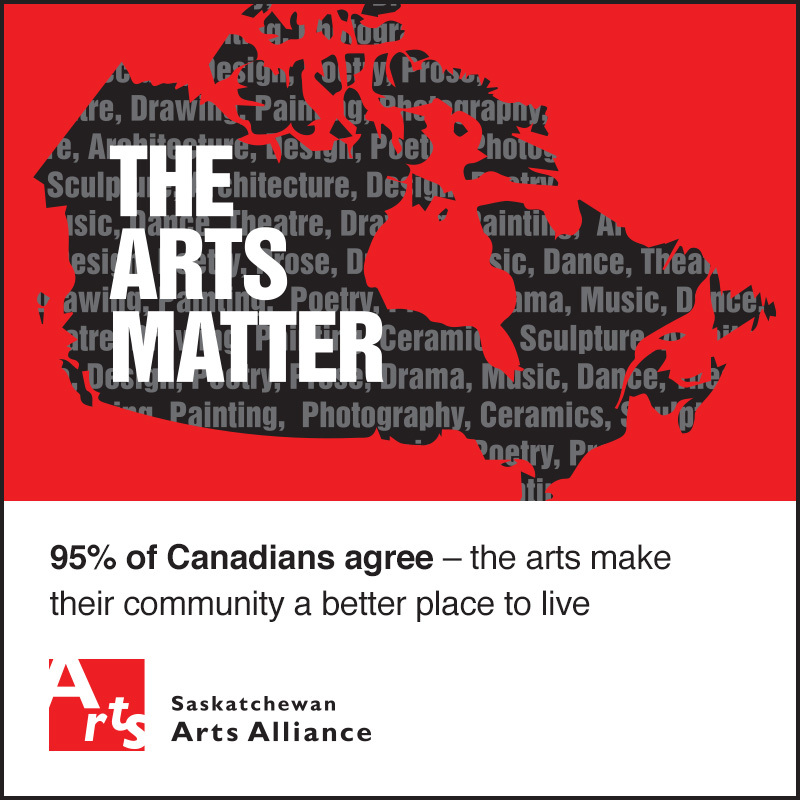 Almost all Canadians agree (95%, including 62% who strongly agree) that the arts make communities a better place to live. 1.Environics Research Group, Arts and Heritage Access and Availability Survey 2016-2017, Department of Canadian Heritage and Canada Council for the Arts, POR number: 051-16. 2017. Teaching the Arts is valuable: The arts teach cultural literacy, artistic skills and techniques as well as a wide range of other valuable skills. 84% agreed "Engaging children in the arts helps them be more creative and expressive." 83% agreed "Engaging children in arts activities is important or their overall development." Arts-engaged low-income students are more likely than non-arts-engaged peers to attend and succeed in college, obtain employment with a future, volunteer in their communities and participate in voting. (1) Strategic Counsel, Building the Case for Business Support of the Arts: A Study Commissioned by Business for the Arts, Feb.2015. (2) Canada Council, Impact of the Arts on Canadian Life. (3) President’s Committee on the Arts and the Humanities (PCAH), Reinvesting in Arts Education: Winning America’s Future through Creative Schools, Washington, DC, May 2011. (4) Warren, Dianne. Future Innovators: Developing Creativity Through K-12 Arts Education in Saskatchewan Schools. Saskatchewan Arts Alliance, August 15, 2016. p6. Arts Education develops five skills that underpin innovative behavior and are linked to the innovation process in youth. These skills match what employers say they most need in their new recruits, but which they too often find missing. Turning STEM into STEAM: "the arts are essential to innovative thinking and behavior and can be applied in all K-12 schools through policy change, inquiry-based curriculum including arts education curriculum, and open dialogue among science, math, technology and arts education teachers" - Dianne Warren's Future Innovators: Developing Creativity Through K-12 Arts Education in Saskatchewan Schools (2). 1) C. Brooke Dobni, PhD, Achieving Growth through Innovation: The Role of Arts Education in Supporting Economic Sustainability, May 2014. 2) Warren, Dianne. Future Innovators: Developing Creativity Through K-12 Arts Education in Saskatchewan Schools. Saskatchewan Arts Alliance, August 15, 2016. p6. (3)LaMore, Rex, Robert Root-Bernstein, Michele Root-Bernstein, John H. Schweitzer, James L. Lawton, Eileen Roraback, Amber Peruski, Megan VanDyke and Laleah Fernandez, “Arts and Crafts: Critical to Economic Innovation” Economic Development Quarterly 2013 27: 221 originally published online 28 April 2013. DOI: 10.1177/0891242413486186. Artists play an important, valuable role in Saskatchewan society and deserve fair compensation for their work. Public access to art and artists – through distribution, exhibition, education and training – benefits Saskatchewan and all its citizens.